One in seven people suffer from chronic discomfort at any time. That is, one in seven people live their life in pain. Pain affects us in many ways physically restricting our movements so we can’t enjoy our everyday lives, getting out of bed is difficult, putting on shoes and socks is a challenge and even getting in the car to work requires more determination than usual. It begins to interfere with the things we enjoy in life like picking our children up, playing sports or relaxing watching a film. Although felt physically, pain is a signal in the brain and affects us mentally becoming the black hole for all of life’s bumps resulting in a lack of motivation and even depression. You begin feeling anxious and irritable, It affects your appetite, your sleep, you can’t concentrate and you can struggle to remember things. If you are in pain, it is important to realise you have a problem. Pain is not a random feeling, it is a signal from your body to your brain, letting it know you have damaged a structure or something is not working correctly. Ignoring the pain or masking it with medication can often cause more damage and further problems to your back and your health. We have become a generally inpatient nation when it comes to most things in our lives. When pain is concerned it is even more understandable that we seek a quick fix to the solution. Although this helps in the short term, it masks the real problem resulting in further problems down the line and a major reason for recurring back pain; The problem is still there. When pain strikes, most of us try to grab the first thing in the medicine cabinet, but it may not be safe nor effective for your back pain. Usually paracetamol or ibuprofen are the medications of choice (are only effective in 1 in 4 people), but there are many other painkillers which work in a more targeted and focussed way to deal with your back pain. It is important to avoid drinking alcohol when taking medication as it may increase risks of causing further health problems. It is important to consult a doctor or pharmacist before using ANY medication. Although many people with back pain first reach for ibuprofen, there is no evidence to show that it is more powerful or effective than Paracetamol. Usually prescribed for muscular pain, sprains, strains or ligament damage. Paracetamol can be just as effective for muscular back pain conditions and is much kinder on your body, particular if you have stomach problems. Paracetamol has few side effects as long as you take no more than 500 mg per day, even in the long term. It’s very important to take note of how much Paracetamol you may be taking as it is often included within cold remedies etc. Without realising the amount can quickly add up and result in permanent liver damage or an accidental overdose. Often prescribed for nerve related pain such a Sciatica or even knee or ankle injuries, Co-Codamol is a medication which contains Paracetamol and Codeine. Codeine is an opiate and effectively reduces pain by binding to pain receptors in your brain consequently stopping pain messages from getting through. It can be purchased from chemists in various strengths but has side effects so you have to be careful. You are pregnant, asthmatic, have low blood pressure, kidney, prostate or gallbladder problems. Codeine can be addictive so never take it more than three days in a row and it is important to stick to the recommended dose from you GP. Codeine can cause drowsiness and constipation as it reduces bowel movements. Ibuprofen works by blocking prostaglandins (which regulate inflation) to reduce pain and swelling. Effective for short term muscle and joint pain and swelling such as knee pain or muscle strains, Ibuprofen is an NSAID (non-steroidal anti-inflammatory) drug. When suffering from long term back pain, using slow-release Ibuprofen can be more beneficial for your condition. You are asthmatic, have stomach, liver or kidney problems, pregnant or breastfeeding. As well as promoting inflammation when in pain, prostaglandins also help to protect the stomach lining from acid. As Ibuprofen blocks prostaglandins to help reduce swelling, use can cause damage to your stomach lining resulting in stomach ulcers. Ibuprofen can also cause nausea and vomiting. If Paracetamol or Ibuprofen don’t seem to work, Diclofenac is often the next choice painkiller. A strong NSAID (non-steroidal anti-inflammatory) effective pain killer, Diclofenac is good for severe back and joint pain. Available from chemists, Diclofenac works by reducing enzymes in the body which help to make prostaglandins, as a result reducing pain and inflammation. You have a history of allergic reaction to aspirin or NSAIDS, have heart disease or history of heart problems, high blood pressure, asthmatic, pregnant or breastfeeding, have stomach ulcers, liver or kidney problems. Diclofenac can be very harsh on you stomach as well as increase your risk of heart attack or stroke, especially if used long term or if you already have an underlying heart problem. Many medicines available over the counter contain aspirin or other medicines similar to diclofenac. Taking certain products together can cause you to get too much of this type of medication. 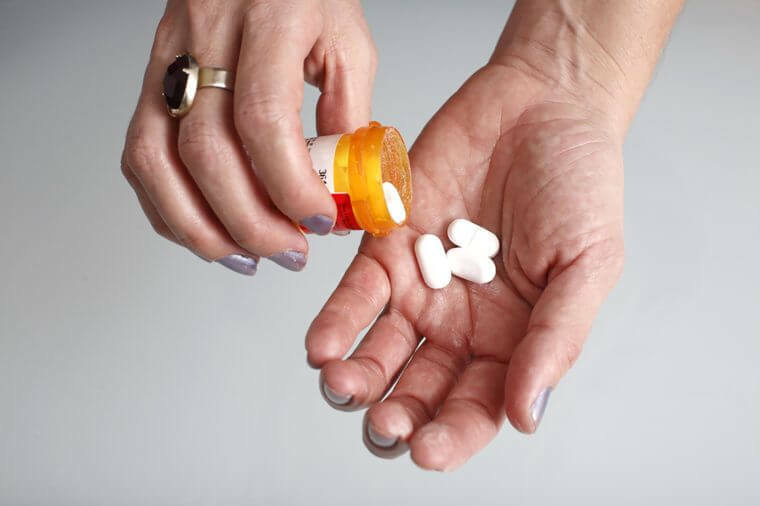 It is important to check the label to see if a medicine contains aspirin, ibuprofen, ketoprofen, or naproxen. Diclofenac can also make you sunburn more easily so try to void exposure to sunlight or tanning beds. Pain relieving gels are frequently found in most chemists. Generally good for arthritic conditions of smaller joints such as hands or knees, they are more effective on superficial structures that are close to the surface of the skin. Useful for people who can not stomach taking medication tables, the variety of gels can provide some relief as they contain different strengths of the ibuprofen, diclofenac or felbinac. The gels are also beneficial as they have few side effects and can be used over the long term. Do not apply to open wounds, grazes or areas of sensitive skin. Although these gels have little side effects they usually have to be applied frequently throughout the day which can be frustrating. As the medication is absorbed through the skin, the pain relief is usually not as effective as tablets. Some gels can possibly cause skin irritation so it is important to read the label carefully and apply a small amount to a small area for trial. Due to the harmful side effects of oral medications, dependant on the back pain condition, we often recommend applying these gels inaction to taking Paracetamol to our patients. Transcutaneous electrical nerve stimulation can often help people with back pain, particularly long term back pain sufferers. A TENS machine is a small, battery-operated device that has leads connected to electrodes. You attach the electrodes to your skin using the pads and when the machine is switched on, small electrical impulses are delivered to the affected area of your body, which you feel as a tingling sensation. The TENS machine works by bombarding your central nervous system with nerve signals which block or reduce the pain signals going to your spinal cord and brain. This stimulates the production of endorphins, which are the body’s natural painkillers helping to reduce or relieve pain or muscle spasm. it is important to place the pads on a place where you do not have broken skin, varicose veins or recent scaring. Do not use if: You have a pacemaker or another type of implanted electrical device, you’re pregnant (except of in labour), have epilepsy or a heart rhythm disorder or have an allergic reaction to the electrode pads. A safe treatment for most people and often used to help reduce pain when giving birth, TENS has few side effect although its effectiveness is based on individual experience. It works for some and not others. TENS is often more effective when used in conjunction with other pain relief such as medication, regular exercise or relaxation techniques. Hot and cold therapy for pain relief has been used for centuries. With back pain, some people find that heat such as a hot water bottle, heat pack or hot bath can help reduce pain and ease some of your back muscle spasms. Cold such as an ice pack or bag of frozen peas can be equally as effective by receding blood flow and sensitivity to the painful area. It is important not to put the heat/ice directly onto your skin as it may cause burns. Wrap the hot/cold pack in a cloth before applying it to the affected area. With ice, it may be beneficial to wet the cloth before applying it to the area. For prolonged use is can be helpful to alternate between hot and cold application as this will reduce and increase blood flow helping to increase recovery. Remember, if you are in pain, there is a problem. Although pain medication can help in the short term, it does not solve the underlying cause of your back pain. If you feel unsure regarding your problem and would like to talk to someone, please call us or try our free no obligation phone consultation? This gives you an opportunity to talk to one of us about your problem and find out whether we can help you, if not we will help point you in the right direction. If you need any further information regarding back pain treatment or low back problems, contact us for free advice. While every effort been made to ensure this article’s accuracy and evidence based, it doesn’t constitute legal advice tailored to your individual circumstances. If you act on it, you acknowledge that you do so at your own risk. We can’t assume responsibility and don’t accept liability for any damage or loss which may arise as a result of your reliance upon it.